This Mastiff print is a fine art giclee made from my oil painting, "It Wasn't Me", a portrait of Bob (Big Ol' Boy), who I was just told ate all of the Halloween candy - including the wrappers! I love how this perspective makes him look very small, with his huge body hidden behind his head. The printed image is 9.5 x 12 inches, with at least one inch of white paper around the border. It is signed by me and includes the title of the original painting directly below the print, which can be matted over, or left to show when framing. The print has been professionally and locally printed on fine watercolor paper with archival inks rated to last a lifetime without fading, and comes with a certificate of authenticity signed and dated by me. This item is backed with study foam core and protected by a cellophane wrapper. It will he shipped surrounded by additional cardboard to ensure it arrives safely. 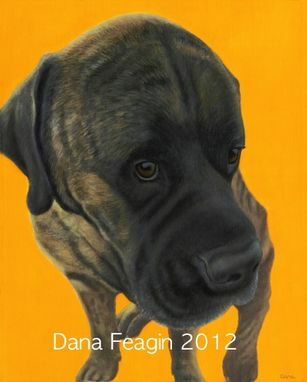 This dog art is perfect for the Mastiff owner, or a dog lover in general. Ten percent of this purchase will be donated to Sanctuary One, a care farm in Jacksonville, OR where I volunteer.